Error monitoring is a crucial process to improve the performance of both humans and artificial cognitive systems. A wealth of experimental studies have shown electrophysiological signals elicited by erroneous actions. 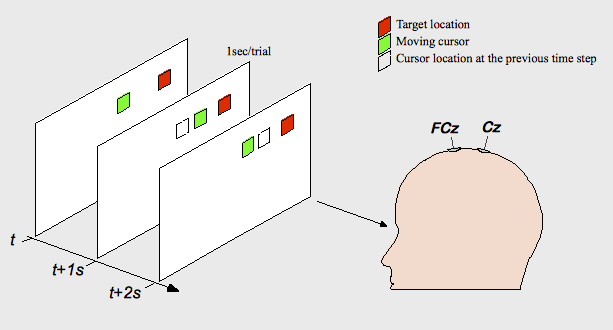 Moreover, similar potentials have also been reported during Human-Machine interaction, including the operation of Brain-Computer interfaces. Several studies have shown that these potentials can be recognized using machine learning techniques such as Gaussian mixture models. This paper explore whether Bayesian filters can also be used for this classification task. Previous studies have proposed the use of probabilistic combination of classifiers for the recognition of human EEG signals. Lemm and colleagues proposed the use of linear combination of two weak probabilistic classifiers in order to aggregate evidence through time for the classification of imaginary movements. In their approach, one of the classifiers is based on the -rythm, computed using Morlet wavelets, as a feature; while the other classifier was based on slow-cortical movement-related potentials, computed by a moving average filter. At every time-step , a class posterior distribution is computed for each feature. The final classification is provided by weighted combination of the class posteriors. More recently, probabilistic combination of classifiers was proposed for the recognition of anticipation-related EEG potentials in a CNV paradigm. 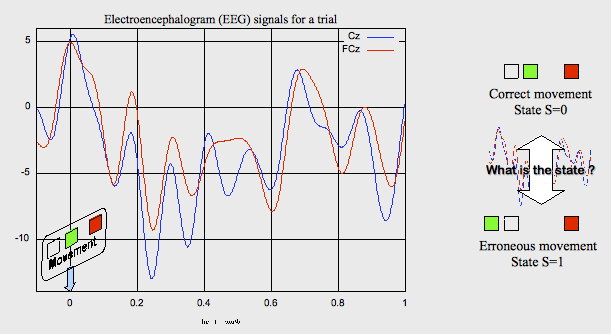 In this paper, we report the use of Bayesian filters for the recognition of error-related evoked EEG potentials. Using data from two electrodes in the time domain we achieve 85% classification of correct trials and 71% for erronoeus trials. In section II we present the experimental protocol, and section III describes the Bayesian classification approach. Obtained results are detailed in section IV, followed by conclusions (c.f. section V).